When you look at a building built downtown in the past half century and compare it to an old building, the largest change you’ll notice other than the materials used is how they fill up space. Older buildings often are built from the sidewalk to the alley, from one property line to the other. Yet newer buildings generally take up a small amount of land and are surrounded by plazas. The reason for this was the introduction of Floor Area Ratios (FAR) in our building and land use codes. FAR is simply the ratio of floor area to the area of the property. A 2-story building built out to the property lines would have a FAR of 2, as would a 4-story building built on half of the property or an 8-story building built on a quarter of the property. The theory behind limiting FARs is that a city can keep a large amount of open space (limiting height, width, and/or depth of a building) while allowing an architect some freedom to design their building as they’d like. The reason that open space is valued in a place like downtown Seattle is to let in sunlight, and to give developers an incentive to give future employees room to enjoy this sunlight on their lunch breaks. I’d argue that unplanned open space has little use in a city. Parks and retail-lined plazas can be valuable in small quantity, but the landscaped or empty plazas that restricted FARs tend to leave us with are uninviting. Setbacks planned using sun angles can provide as much sunlight as our skinny towers, but with much greater density. Of course much of Seattle might value this unplanned open space more than I do, so I propose we start small. Just as Seattle has an unlimited height zone, I propose we create an unlimited FAR zone. This zone would allow buildings built right to the property lines up to 7 stories high, then set back based on solar modeling. Buildings on an east or west side of a street might be set back more, whereas maybe a north-side building face could rise straight up. Parks and plazas would be city-planned and paid for by new construction. The result could build a far more dense area than just increasing building heights. This density would bring everything closer – more people could access these parks, more stores and restaurants would be in walking distance, and better transit could be built. Some of our most beautiful and valued buildings and neighborhoods were built before FARs were a requirement. I’d love to see us try to build this way again. Matt Gangemi, PE, is a mechanical engineer, and for the last decade has been designing and analyzing efficient mechanical systems for buildings. Photos by the author. This post originally appeared on the Seattle Transit Blog. 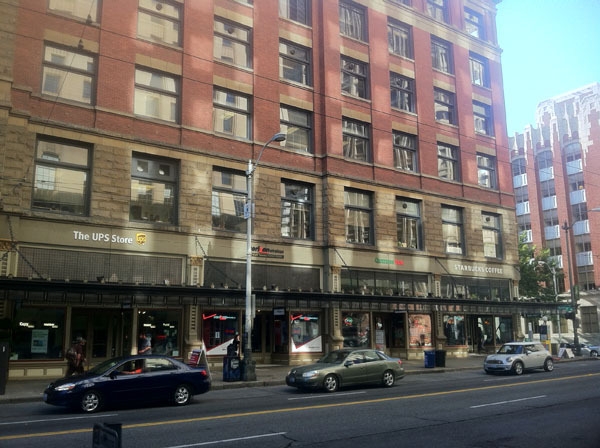 Robert Campbell says that the most pedestrian-friendly streets are those where there are street-level stores and businesses with windows and doors at the sidewalk.